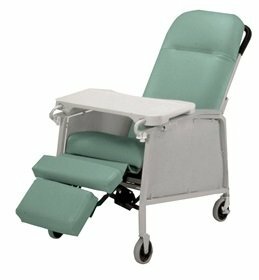 Flex-o-lator™ seat reduces pressure areas, eliminates bottoming out and supports long-term seating. Ergonomic seat back with variable-density foam correctly supports and promotes good posture. Automatic-adjusting footrest helps control edema. ­Self-storing adjustable table included.